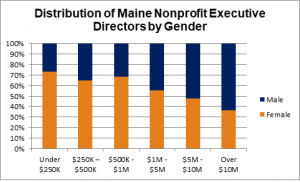 Nonprofits employ 16% of Maine workers and are essential partners in our state’s workforce development efforts, so understanding nonprofit compensation trends is a critical element of attracting and retaining talent to our state. 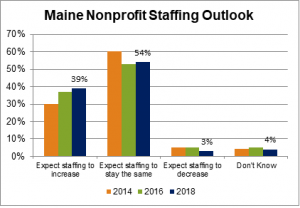 What compensation trends stand out from MANP’s recently released Report on Nonprofit Wages + Benefits in Maine? 1. Nonprofit employment reflects the continuing economic recovery. Ninety-three percent (93%) of organizations expect employment to stay the same or increase in the coming 12 months. There were significant drops in the percentages of organizations contracting bookkeepers, project managers, and grant writers as compared to 2016, which indicates employers are more confident in the economy and therefore more willing to commit to permanent hires. 2. But, Maine’s strong economy is not translating into gains for nonprofit employees. 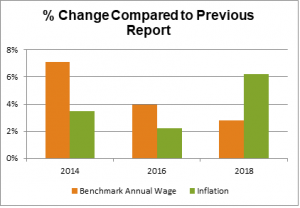 The Benchmark Hourly Wage—used to track the average wage across 27 core positions in the survey over time—rose just 2.8% over the past two years, lagging behind inflation of 6.2% during that same time period. Only one-third (34%) of the full-time positions included in the benchmark saw an increased average salary as compared to 2016; just 13% of full-time benchmark jobs saw increases in excess of inflation. Benefits as a percentage of wages stayed level with 2016, so also behind inflation. 3. Rising insurance costs continue to strain employers and pinch employees. More than three-quarters of respondents (78%) offer group health insurance up from 73% in 2016 and the vast majority of these pay at least half of employee premiums. This is still behind pre-recession levels, however, and three quarters of those offering this benefit reported rate increases during their last renewal period, more than in 2016. Employees are feeling the weight of these rate hikes in the form of higher premiums, co-pays, and deductibles as nonprofits pass along at least some portion of the costs to employees. Plus, more than half of responding organizations leave it to their employees to fund their own retirement: 38% of organizations offer no plan and 13% offer a plan with no employer contribution. 4. Gender disparities remain in both hiring and pay. As in the past, women tend to run the smaller organizations, while men are more likely to run the largest ones. Overall, female-identified executive directors are paid 81 cents on the dollar as compared to their male-identified counterparts. This gap closes almost completely, however, for organizations with budgets under $1 million. Overall, the 2018 report paints a concerning picture for nonprofits as well as their employees. Yes, nonprofits expect to increase staffing, but if nonprofits are unable to offer competitive wages will they be able to hire qualified employees to advance their missions? Will the sector’s top talent seek employment elsewhere? As senior leaders retire, will younger leaders be willing to step into their shoes? How will the effects of tax reform in late 2017 affect nonprofits? One can hypothesize that under investment in human resources is a result of the budgetary pressures of shrinking state and federal funding, lack of funding for operating support, rising healthcare costs, and uncertainty about donor behavior under tax reform. Nonprofits employ almost 20% of workers in Maine, and are critically important to Maine’s economy and quality of life. This report suggests that nonprofits—and the policymakers, funders, and donors that care about their missions—must give higher priority to sustaining the nonprofit sector’s most important resource: human capital. Nonprofits are complex and strategic organizations that provide essential community infrastructure; they rely on their human resources. Market comparison studies are a starting point for developing compensation strategies to recruit and retain talented employees. Objective salary data is essential to nonprofits that must justify organization compensation levels to their boards, the IRS, and the general public. This report is not a definitive answer on what nonprofits should pay their employees, but provides a frame of reference for what organizations are paying, and should be used to inform thoughtful conversations about compensation. Find a free snapshot of the report, as well as ordering details. MANP members receive a 50% discount on this essential tool.